The issue of a new stamp represents the final stage in a long process extending over two years. The public is invited to submit proposals to the Stamp Advisory Committee, which submits its recommendations on designs and choice of artists to the Canada Post Corporation. Often, several artists are invited to submit artwork. The design of new artwork is often requested from the artist chosen, in order to respond to the comments received. The approved artwork is next sent to the printer who will take care of the printing of the stamp using certain specific processes. In Canada, steel engraving was used almost exclusively until 1970. Since then, lithography has been by far the most widely used process. 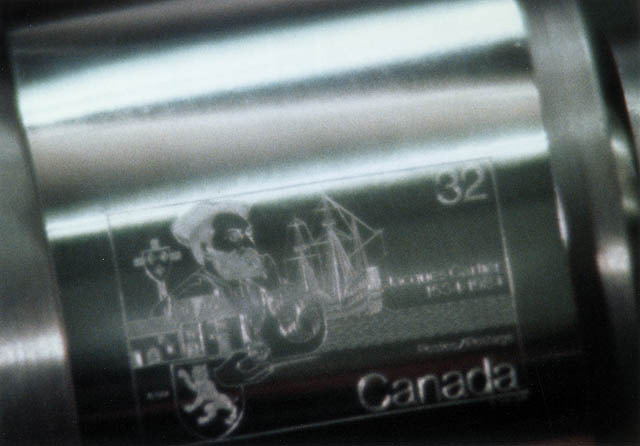 The stamp issued on April 20, 1984, dedicated to the first voyage of Jacques Cartier in 1534, is used here to illustrate this entire process. The excerpts from the videos show the different stages in producing the last pane of the Historic Land Vehicles series issued in 1996. The Committee, established in 1969, studies proposed themes and designs and submits its recommendations to the Board that manages the Canada Post Corporation's annual stamp program. The Committee's recommendations must meet a series of objectives and criteria. Enhance the regard in which Canadian stamps are held in Canadian and international philatelic circles. Foster a spirit of national and international goodwill and understanding. 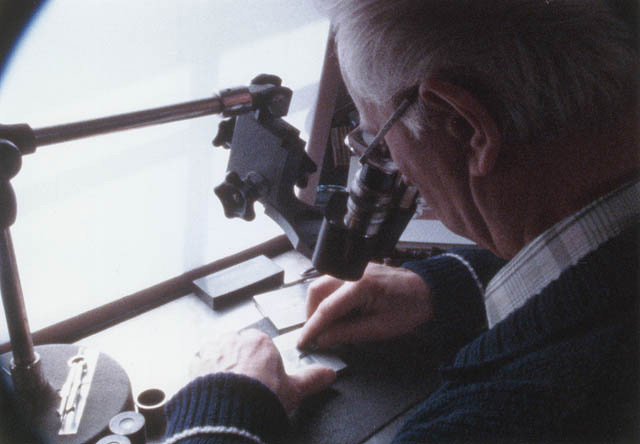 The Jacques Cartier stamp, issued in 1984, has been chosen to explain the selection process for a stamp designer, because it is well-documented. The idea of a joint issue between Canada-France to mark the 450th anniversary of Jacques Cartier's arrival in Canada was raised in June 1982 on the occasion of the Philexfrance International Philatelic Exhibition. In April 1983, an official agreement was concluded between the two postal administrations: the stamp design would be the work of a Canadian, while the engraving and printing would be taken care of by the French. The Stamp Advisory Committee invited three Canadian artists to submit artwork. Each artist was provided with historical documentation to facilitate the preparation of their works. One artwork proposed by Pierre-Yves Pelletier shows the Canadian portion of the route travelled by Cartier in 1534. The map features a sailboat of the era. The artwork also shows the name and denomination of both countries, which would have been a world's first. Competition winner Yves Paquin's artwork proposed several components from Cartier's life: the manor of Limo�lou near Saint-Malo, the Saint-Malo coat of arms, the cross erected at Gasp�, his ship the Grande Hermine and a long peace pipe. The graphic artist selected for the Jacques Cartier stamp, Yves Paquin, had to modify his artwork on a few occasions. At France's request, the horizontal format was selected. The banner and the inscription "Cartier 1534" were removed. As well, the Saint-Malo coat of arms was replaced by those from Cartier's time, displaying a rampant dog. Finally, a short terra-cotta pipe was substituted for the long-feathered pipe, which was not in fact used by the American Indians Cartier met. Yves Paquin is shown here working on a version that includes these corrections. His tools basically consist of a set square, a compass and an "ideographic" grid of his design, which can be seen in the background. Yves Paquin spent close to 200 hours on this project. For the Historic Land Vehicles series, illustrator Cameron Wykes designed the various topics on a computer, with a wealth of detail rarely seen on Canadian stamps. The Aldus FreeHand software package was used to generate the line drawings, shadings and colours. The designers used the QuarkXPress desktop publishing software for the typography and montage. Using computer software greatly simplifies the task of the stamp designer, who can freely manipulate the computer-generated images. As stamps have a monetary value, they are printed in accordance with strict production and security criteria. Until the end of the 1960s, the majority of stamps issued in British North America were printed using an engraving process called steel engraving or intaglio, which made counterfeiting the stamps difficult. 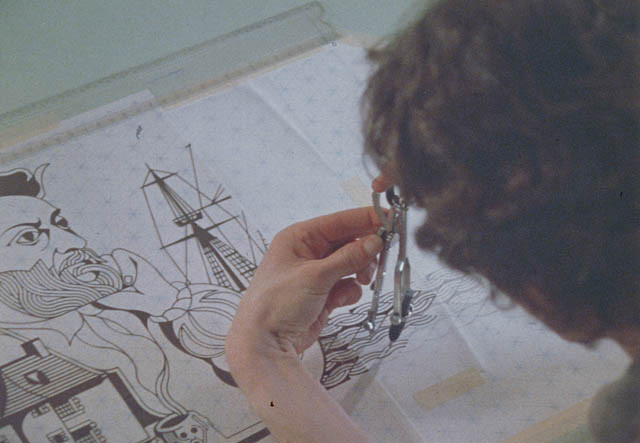 This is the process that was used for the Jacques Cartier stamp. However, this process did not provide artists with much flexibility and could generally only produce monochrome or bicoloured stamps. 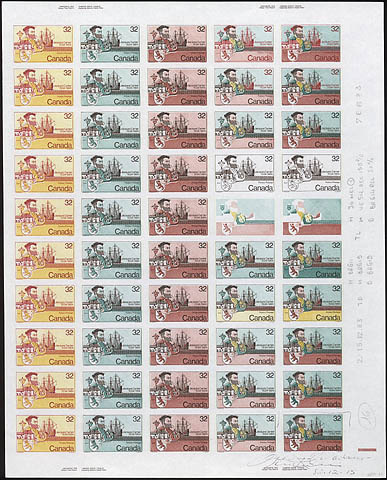 With the introduction of photogravure and colour offset photolithography in Canada in the 1960s, it became possible to print more detailed multicoloured stamps. Today, the majority of Canadian stamps are produced using these two processes. 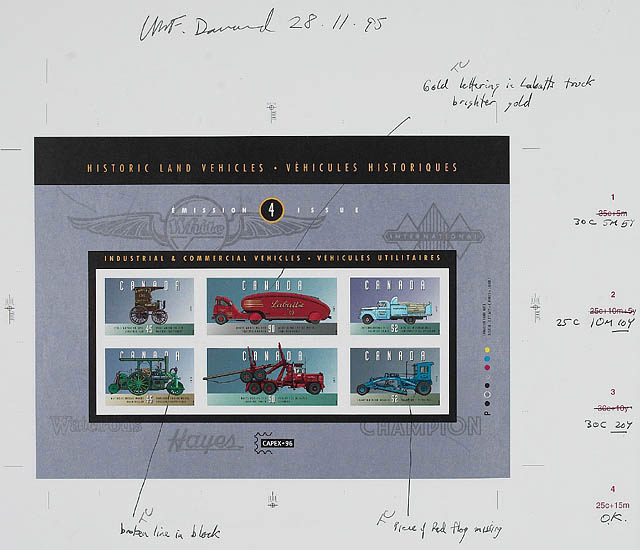 Colour offset photolithography was the process used for the Historic Land Vehicles pane. When the artwork for a stamp is created and approved, experienced engravers employed by the printers of bank notes and other currency accurately transfer the original artist's design on to a soft steel sheet, called a die, using special engraving tools. In the case of the Jacques Cartier stamp, the artwork was sent to French engraver Claude Haley (1923-1988). Originally, a large number of designs were created using the same dimensions as the stamp, but today the artwork is usually five times larger than the stamp. The dimensions of the engraved "mirror image" are often greatly reduced compared with the original artwork, and this reduction work requires patience and skill on the engraver's part, because the design must be transferred accurately from one medium to another. Progressive proofs are made on thick paper at different stages in the process to ensure that the engraving is satisfactory. These proofs are also sent to the competent authority issuing the stamp for the purposes of comments, approval and preservation. The approval of the die proofs allows the printer to move on to creating the transfer roll (or transfer cylinder) and the printing base. When the die bearing the image of the stamp has been officially approved and has hardened, it is pressed by a small soft steel roll (transfer cylinder) under the high pressure exerted by the transfer press: the design is taken up on the roll, as a relief transfer. The image thus obtained is the exact reverse of the one engraved on the die. 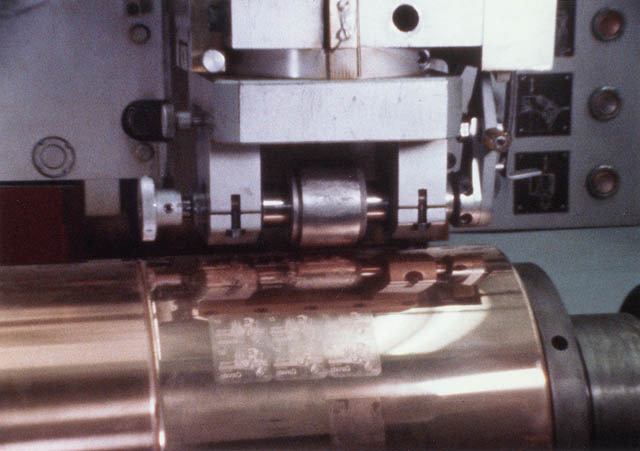 Once again, the roll is hardened and then used to create the metal printing plate which will carry many images of the stamp, and the stamps are printed using this plate. Each of the stamp images on the printing plate must be the exact copy of the one on the original die. When the specialized engravers who make the plate are satisfied with it, it is hardened and is then ready to be used for the printing process. This phase of stamp production is termed siderography. Just as in the preparation of the die, progressive proofs are made at various stages of the printing to establish if there is a need to modify any part of the printing base. When this is approved, the complete, final printing plates are prepared in the stamp issue colour. The printer or the organization issuing the stamp usually keeps these plate proofs in its permanent files. These documents authorize the printer to print the official stamp. The partial plate proof of the Jacques Cartier stamp, created by the Imprimerie des timbres-poste de France, is special, with 23 different colour trials for a group of 50 stamps. The final colours appear on the stamp in the lower right corner. The original lithographic process was based on the principle that grease and water repel each other. The process therefore permits an impression to be made at the same level, contrary to steel engraving. The original design is drawn on a calcareous stone using greasy ink (lithographic). The stone is then treated with chemicals, thus fixing the design in the stone. Next, the stone is wetted and then the ink is applied to the roller. The greasy design holds the ink, while the rest of the damp stone repels the ink. One sheet of paper is pressed on the stone providing a reverse image of the original design. Offset photolithography is based on the same technique. The approved artwork is photographed and transferred to zinc or aluminium treated plates. This plate is inked and the image is transferred to a rubber cylinder. This cylinder (the blanket) transfers the image to paper. This technique does not reverse the original design and its flexibility allows for the use of several colours. 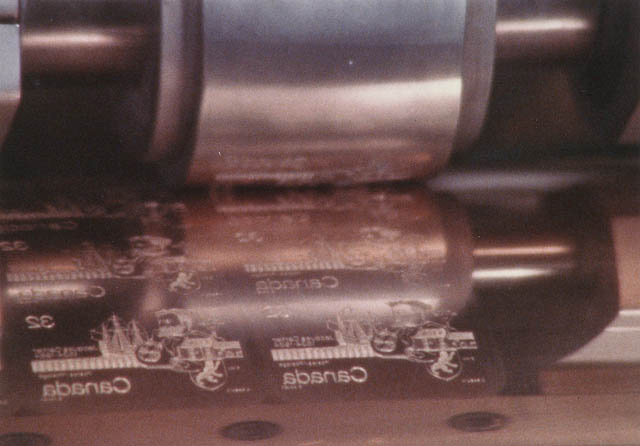 The final pane of the Historic Land Vehicles series, issued in 1996, was created using this photolithography process. The plate proof represents the second verification signed by William F. Danard, the Canada Post Corporation representative. The comments informed the printer of the details remaining to be corrected before the stamps were printed.